De La Hoya: Why doesn't Chavez Jr. just fight Sergio Martinez? De La Hoya: Why doesn’t Chavez Jr. just fight Sergio Martinez? By Chris Williams:: Oscar De La Hoya is open to putting together a fight between his guy WBC junior middleweight champion Saul Alvarez and WBC middleweight champion Julio Cesar Chavez Jr. at a catch weight of 156 pounds instead of at 154, Alvarez’s weight, or 160, the weight class that Chavez Jr. fights ago. However, some boxing fans don’t like the idea of De Hoya asking Chavez Jr. to come down four pounds to make the Alvarez-Chavez Jr. fight happen. These fans wants Alvarez to move up six pounds and face the still bigger Chavez Jr. at the full middleweight limit rather than Chavez Jr. being the one to meet Alvarez at a halfway point or close to it. Obviously, Chavez Jr. is being kept away from fighting Martinez because it’s not considered a winnable fight for the young Chavez Jr. at this point in his career. That could change in four or five years when Martinez is past 40, and Chavez Jr. is still only 29 or 30. However, I doubt Martinez will still be around by that time. That’s why it would be good if this fight could be made now rather than waiting until Martinez has slipped to make the fight happen. I agree with De La Hoya about the catch weight for the Alvarez-Chavez Jr. fight. You can’t have Alvarez moving up six pounds to fight a guy as big as Chavez Jr., who recently rehydrated to 180 pounds the night he fought Sebastian Zbik. I’m not sure how much Chavez Jr. weighed last Saturday night in his win over Peter Manfredo Jr. but my guess is he weighed at least 170+. If Alvarez is coming into a fight just barely making 160, he’ll be at a huge disadvantage against a guy that’s both taller than him by three inches and out-weighs him by 15 to 20 pounds. 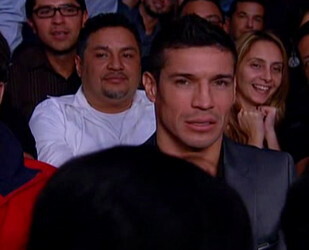 Boxing » Julio Cesar Chavez Jr. » De La Hoya: Why doesn’t Chavez Jr. just fight Sergio Martinez?